The Twisted Branch Trail run is a point to point course. For a small fee we will be offering a shuttle service from the finish line area to the starting line evening BEFORE the event. There will be no shuttle service the morning of the event. The shuttle will leave Hammondsport High School on the Friday evening before the race. If you are interested in the shuttle service you must purchase a ticket through ultra sign up. If you have already registered and need help purchasing a ticket please reach out to us. Camping is free to all runners. On friday night free camping is located at Ontario County Park near the pavilion loop. We will send parking and camping maps out to all entrants as we near the event. Camping on Saturday night, after the race, will be at the Hammondsport Fire Hall. The Fire Hall property is adjacent to our finish line. We will help transport any camping gear you need from Ontario County Park to the Fire Hall. 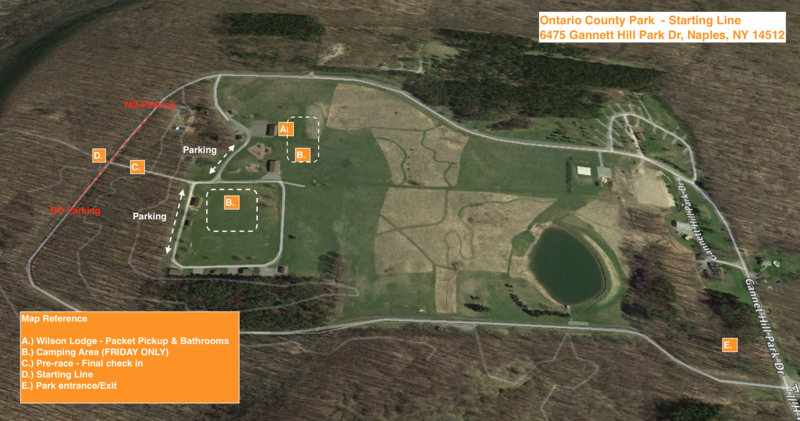 You can make other arrangements with Ontario County Park as they do have campsites and cabins available. Those sites are not free. In addition to the free camping sites we already offer, we will now be offering tent rentals. The race will set up your tent for you at the starting line, tear it down, and have it set up for you again at the finish line. As always we'll transport your gear to the finish line! Traveling on I-86, take I-390 North to Exit 2 toward Cohocton. Take Route 371 North to Route 21 North, and pass through the Village of Naples. Continue on Route 21 North to Route 64 North. In a 1/4 mile turn left onto Gannett Hill Road. At the top of the hill turn right into the park. Traveling eastbound on the NYS Thruway, take Exit 45 toward Victor. Turn left on to Route 96 South and travel into the Town of Victor. Turn right on to Maple Avenue/County Road 3. County Road 3 becomes Route 20C/Route 444. Continue through the Town of Bloomfield. Turn left on to Route 5 & 20 East. Turn right onto Route 64 South/Bristol Valley Road. Travel 14 miles to Bristol Center, make a right onto Gannett Hill Road. At the top of the hill turn right into the park. Traveling westbound on the NYS Thruway, take Exit 43 toward Manchester. Turn right on to Main Street/Route 21 South and travel into the Town of Canandaigua. Turn left on to Route 332 South/North Main Street. Turn slight right onto Route 5 & 20 West/Western Boulevard. Turn left on to Route 21 S/Bristol Road. Bristol Road becomes County Road 32. Continue into Bristol Center. Turn right onto Torrence Rd. Then make a quick right, and then left onto Gannett Hill Road. At the top of the hill turn right into the park.